Here at Halifax Mermaids we are always striving to make things more convenient for our clients. A request we've heard for years is: "do you sell children's tails?" For a few years the answer was no. But recently Mermaid Mimi has taken up making basic custom swimsuit fabric tails on a first come first serve basis. 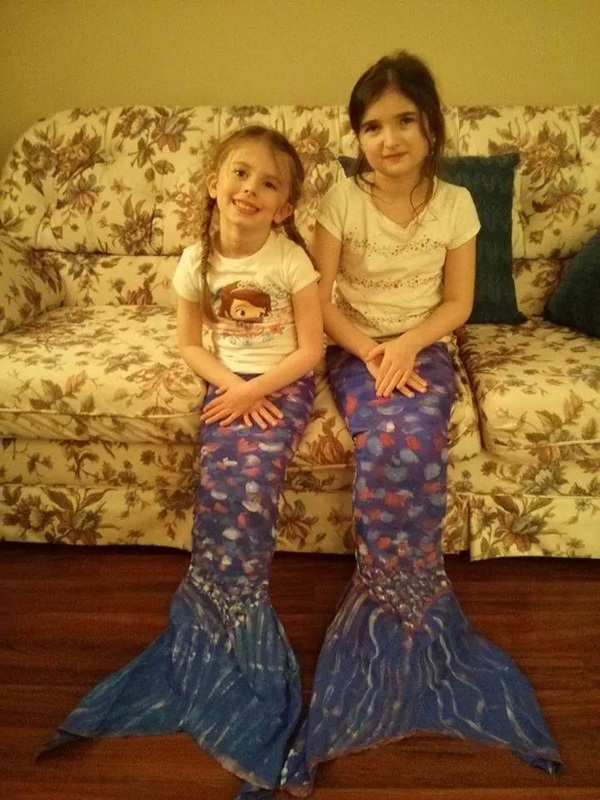 Mermaid tails- even the fabric ones just for kids- typically cost a lot of money. The companies are mainly based in the USA or overseas. When ordering a tail you pay a higher rate due to currency exchange, then shipping is added on, and customs fees. It's normal for fabric tails to cost between $100-$200 for a child. We are first and foremost an entertainment company. We have no wish to be a tail making company and do not have access to the bulk materials these companies have at this time. We may consider making higher scale fabric tails in the future... but for now we offer BUDGET tails, hand made, custom made, without a fin for your kids. The tails are not made by our company, but are rather done as contract work currently through one of our members: Mermaid Mimi. When you order a tail you'll be directed to her and you'll deal specifically with her. You'll pay her directly, and she'll give you different quotes based on what you're looking for. The tail will not show up on your invoice for your party booking. These tails are budget and basic. They're made from swim suit material and depending on what you're looking for: can be hand painted to have a particular colour or design based on what your child likes. These tails are costumes. While they can be worn in the water we accept no responsibility for the safety of your child. 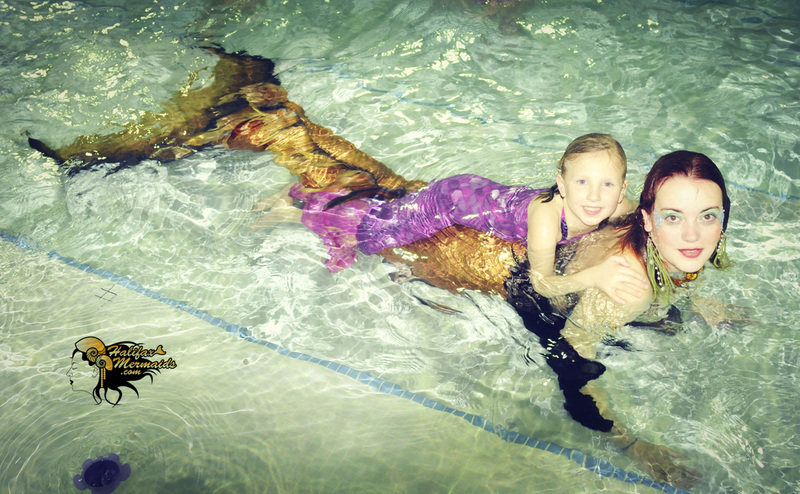 It's up to you to determine if your child is a strong enough swimmer to use a tail. You should always be present with your child when they are swimming. Please do not put in the washer and dryer. Hand wash and air dry only. These tails come open at the bottom and we do not sell monofins. You can purchase your own monofin online if you'd like and either velcro or sew the bottom closed over it if your child is a strong enough swimmer. Monofins are not sold in Canada and need to be imported typically online from the USA. Having the bottom open also allows children to kick their feet when need be, and wear the tail as a dry land costume too. These tails are made to the measurements YOU give Mimi. So please be sure to measure more than once and make sure your measurements are accurate. We are not responsible for errors in measuring. Mimi can only make what you supply her with. Similarly; if you order your tail many months before you give it to your child there is a high chance your child may have outgrown the tail before they receive it, or will outgrow it soon. The materials ARE stretchy just like a bathing suit. But it's up to you to take those things into consideration. Tails are like any other piece of clothing. They wear out over time. Having multiple children of multiple sizes wearing the tail will stretch the tail out and could pop the seams. This was made to custom measurements, not a one size fits all. If a child drags the tail along the pool deck or the sides/bottom of a pool it can tear and fray just like any other fabric. When used frequently especially in chlorine the colours may fade over time. Due to the custom nature of the tails there are no refunds or exchanges. These tails are individually made with love for your child and from input from you. Please be sure this is the right product for you and that you have an accurate expectation of what you're purchasing.